During a fire, an elevator shaft acts just like a chimney, funneling smoke upward to higher floors. Even if the fire itself is contained, the resulting smoke puts the building’s occupants at considerable risk. That means it’s not enough for architects and engineers to consider only fire containment in their building designs. They also need to address smoke containment as a safety issue. Updated regulations and industry innovations mean there are now better and simpler solutions for smoke protection when it comes to elevators. If three or more stories in a building are connected by an elevator shaft, fire and safety codes require the design to isolate each floor from the shaft with both fire- and smoke-rated protection. To isolate each floor, architects used to use enclosed elevator lobbies as the gold standard for fire and smoke containment. The idea was that, even if smoke gets into the elevator shaft on the floor where the fire is located, the smoke won’t be able to infiltrate other floors. Unfortunately, there are a couple of problems with that solution. 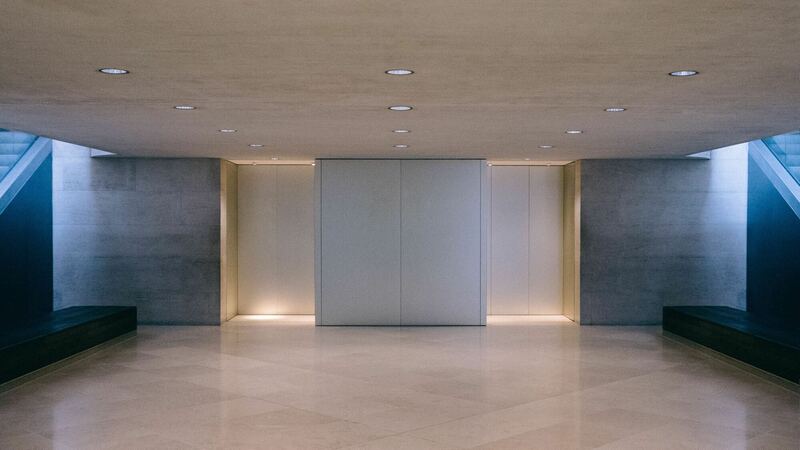 An enclosed elevator lobby limits architects’ ability to be innovative, making it difficult to design a code-compliant building with anything other than a standard office tower design. Plus, enclosed elevator lobbies take up valuable space that could be used for other design purposes. Whether it’s one more apartment, one more hotel room or one more work area, most building owners don’t want to give up any more square footage than they have to. Fortunately, the industry has developed some impressive approaches to smoke containment in elevators, and fire and safety codes have been updated to account for these solutions. Updated codes now say that if the ground floor has an automated sprinkler system, it doesn’t need to have an enclosed elevator vestibule. 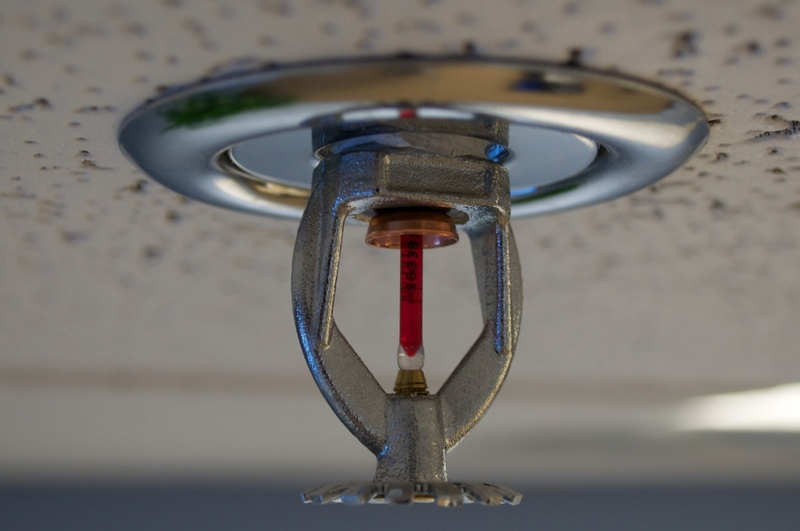 When a building design includes automatic sprinkler systems, protective assemblies only need to be rated for smoke protection (and no longer require a fire rating). Since all high-rise buildings require automatic sprinkler systems, many high-rises can take advantage of this code exception and specify simpler solutions like smoke partitions or curtains. Enclosed elevator lobbies are also no longer required for buildings less than 75 feet tall that have automatic sprinklers on every floor. A vestibule would still be required on higher floors, but the ability to eliminate it on the ground floor (which sees the most traffic) lets architects use design options that are more aesthetically pleasing, like atriums and other open spaces. 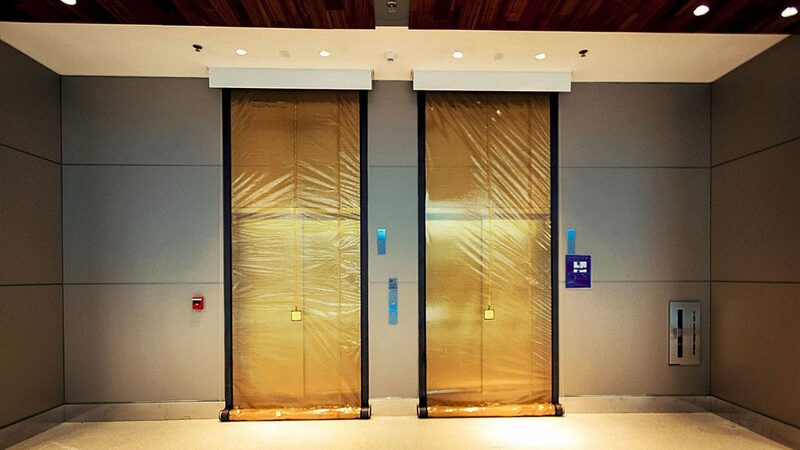 Another alternative to an enclosed elevator lobby is to pressurize the elevator shaft. This design uses fans that push enough air into the shaft to create a positive-pressure environment, which keeps smoke from being able to enter the space. Architects can also meet code by specifying a gasketed swing door be installed directly at the elevator’s opening. The door is held open with a magnetic device. These types of fire doors compartmentalize the building during a fire when they’re closed properly, which prevents the spread of smoke and flames. “The intent is to protect the means of egress and allow building occupants time to evacuate safely,” says Lori Greene with Construction Specifier. But these doors can often be blocked or held open during a building evacuation. “If fire doors are blocked or wedged open, they will not be able to do their job and protect the building and its occupants,” says Greene. There are a couple of other solutions that are accepted by the ICC as substitutes to an enclosed elevator lobby: accordion doors and rolling magnetic gasketing systems. Accordion doors are a flexible fire and smoke barrier solution. 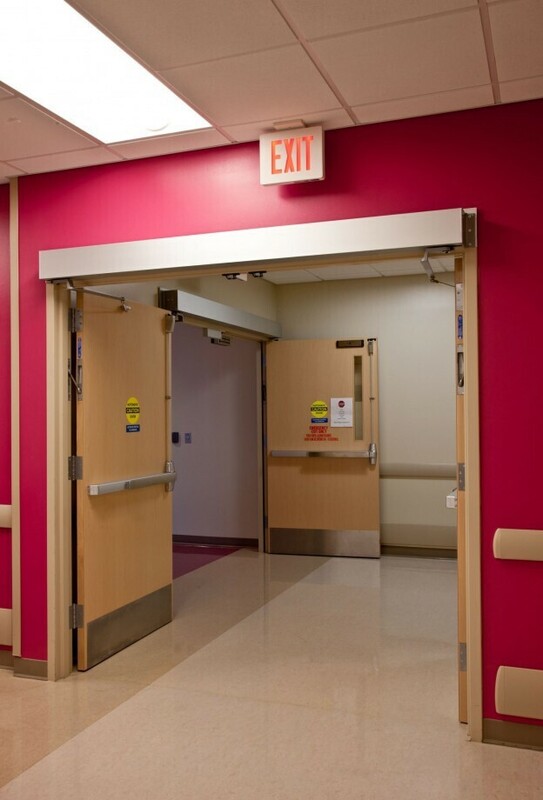 These large, steel doors deploy horizontally along a track in the ceiling when a fire is detected, but hide in a pocket in the wall when not needed, leaving the space open during regular day-to-day activities. Rolling magnetic gasket systems are another code-compliant solution for architects. A magnetic connection, which means they don’t have to be permanently installed within the structure of elevator openings. A translucent design, which means that both firefighters and building occupants can see what’s on the other side. ADA compliance: Building occupants can open them either with a switch or by exerting less than 15 pounds of pressure, making them ADA-compliant. Evolving building codes have given architects and designers the ability to create innovative designs that meet client needs without violating fire codes or endangering occupants. While choosing the best option varies by architect, building and client, the flexibility of smoke curtains makes them a viable choice for many design scenarios. 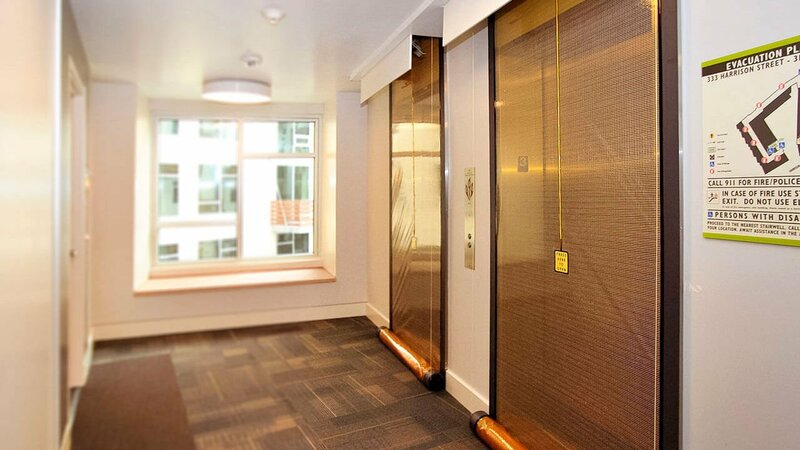 If you want to learn more about how Smoke Guard’s own innovative smoke curtain design offers code compliant flexibility and safety, check out our elevator curtain FAQ page here.